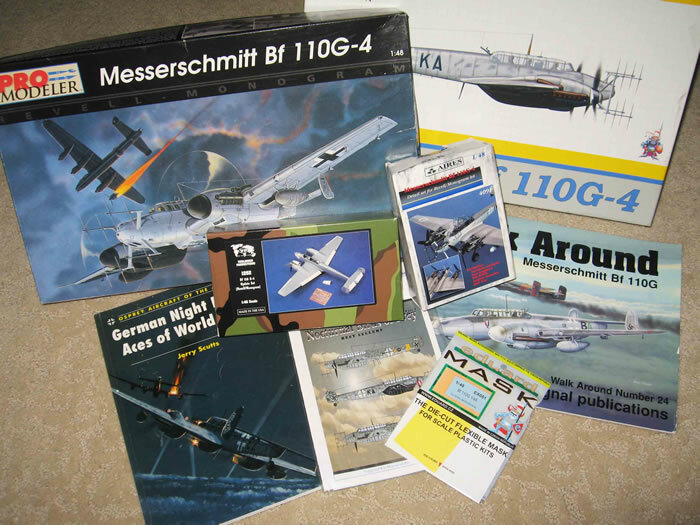 A had been wanting to add a 1/48 scale Messerschmitt Bf 110 to my collection for some time but this was a bit of an unusual project. 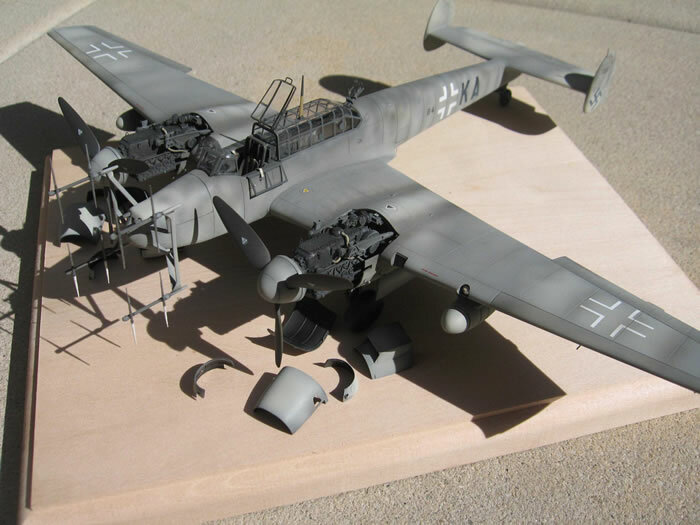 It started out as a straightforward build of the new Eduard Bf 110 G-4 but morphed into something of a Revell kit-bash along the way. 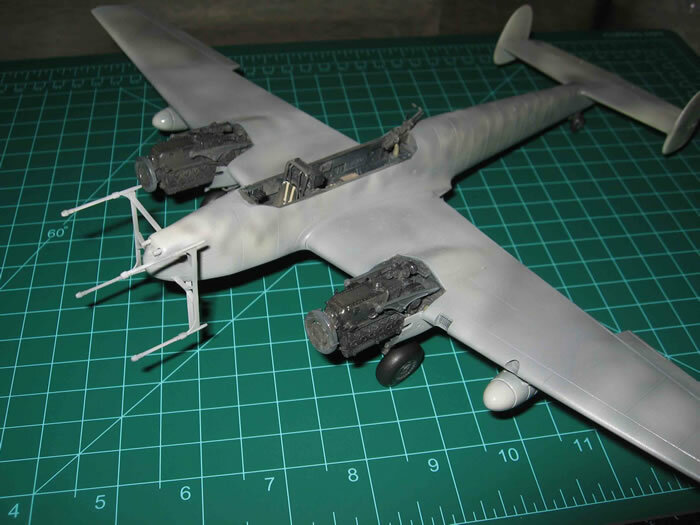 I picked up the Eduard kit at my local hobby store and wanting to add some extra detail, ordered an Aires engine-set, some after-market decals and the Verlinden details. The Aires set is amazing – a huge amount of finely-cast resin crammed into the tiny box (including two full engines with their firewalls). 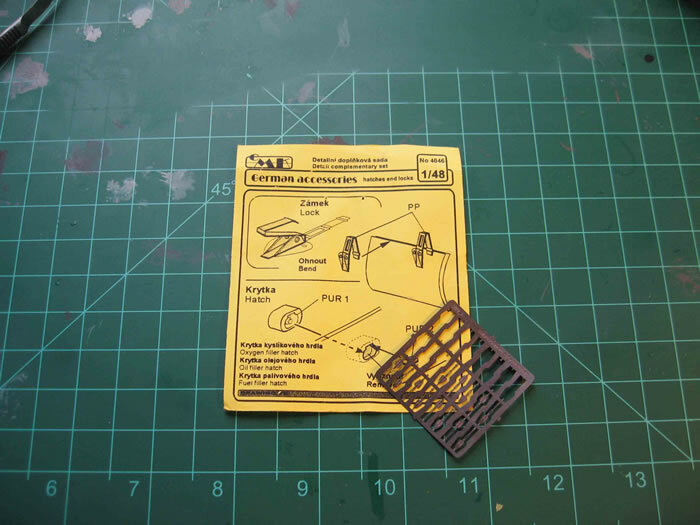 The Verlinden set is much less comprehensive but offers major control-surfaces. The cockpit went together nicely, massively enhanced by the Aires components but the engine/firewall joins needed careful fitting/filling & sanding before I was satisfied with their appearance. 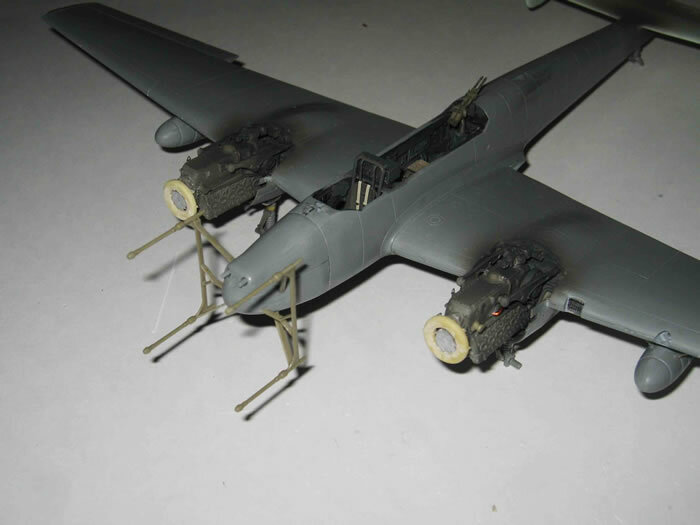 Basic fuselage and wing structures were nicely reproduced in the older Revell kit but finer details like fuel-tanks and their supports, machine-guns and most notably the external radar antennae were poor so I cannibalized everything I needed from the Eduard kit, adding selected control-surfaces from the Verlinden set and hand-making various other “dangly-bits”. Lining up the engines was tricky and I intentionally left the spinners off until the blocks were in place. 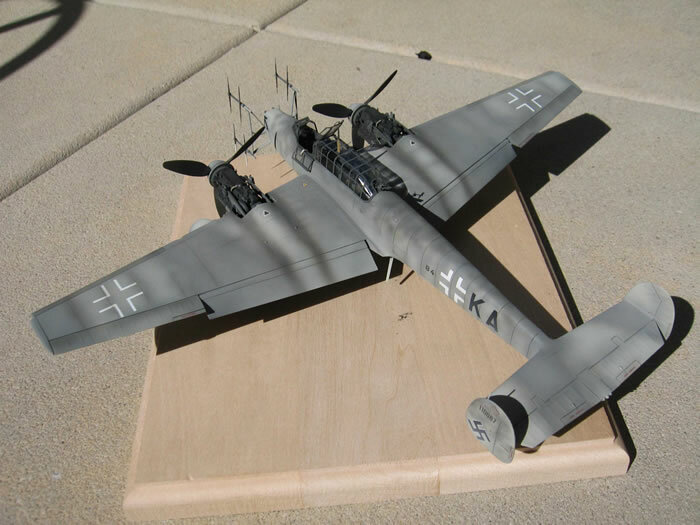 Inspiration along the way came by way of Chuck Wojtkiewicz’s stunning ME-410 build. If you haven’t seen it – type the key words “1/48 Me-410 plus kitchen sink” into a search engine, sit back and enjoy – he’s truly a master! I chose a subtle mix of light greys & mottles for the overall finish. 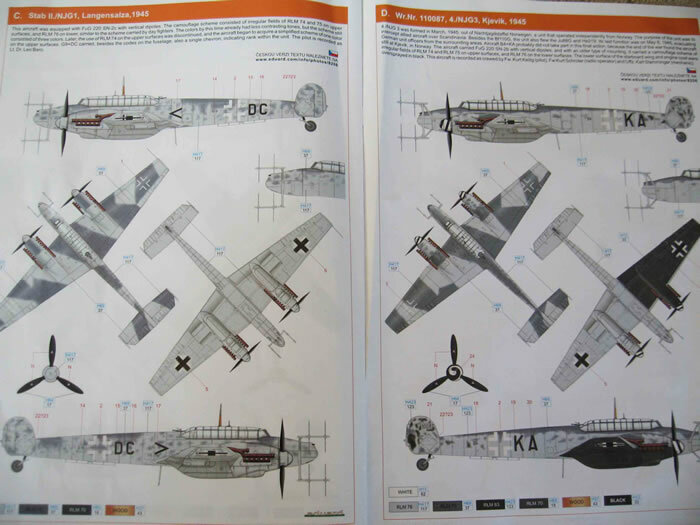 Eduard provides beautiful color-plates in their instruction booklets, which helped with planning and Squadron’s “walkaround” was another excellent source of reference material. The base colors were all Humbrol enamels but I also used a few light coats of Tamiya (acrylic) black and “smoke” where appropriate. 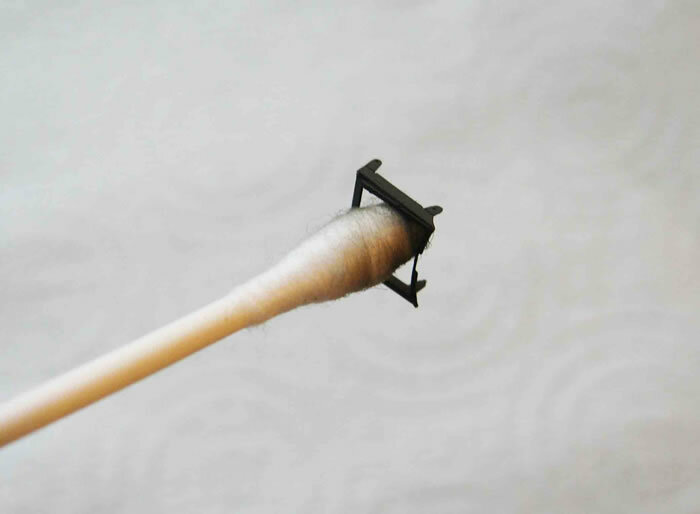 The two mediums worked very well together with sufficient drying time between applications. 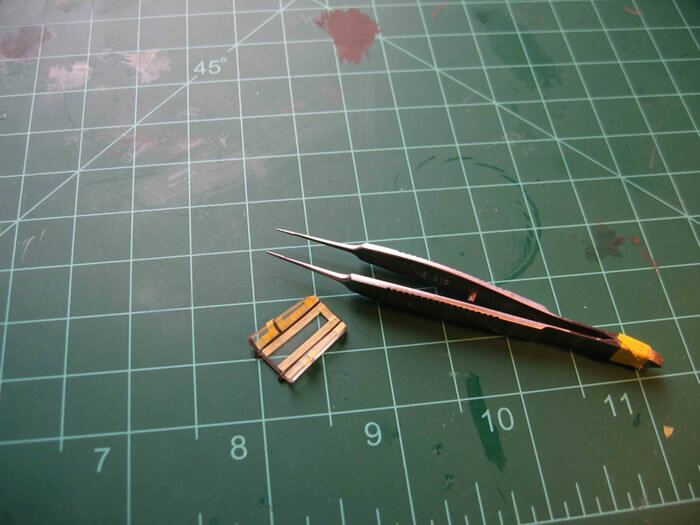 The Eduard kit included an excellent sheet of photo-etch (including the neat but very fiddly front-windshield-armor-frame & I also added some of CMK’s excellent little panel-locks. Finally it was time for the canopy and this is where things become difficult. 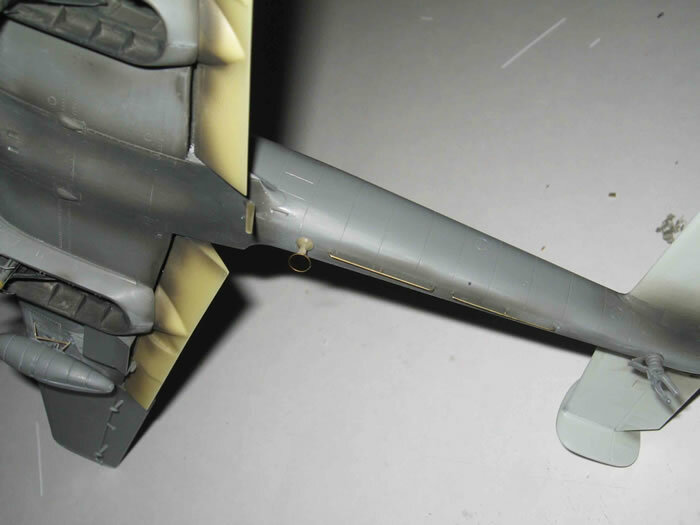 I had planned to display the aft canopy-section in the open position but the Revell (clear) plastic was thick and chunky looking, wrecking the scale-appearance of the model. 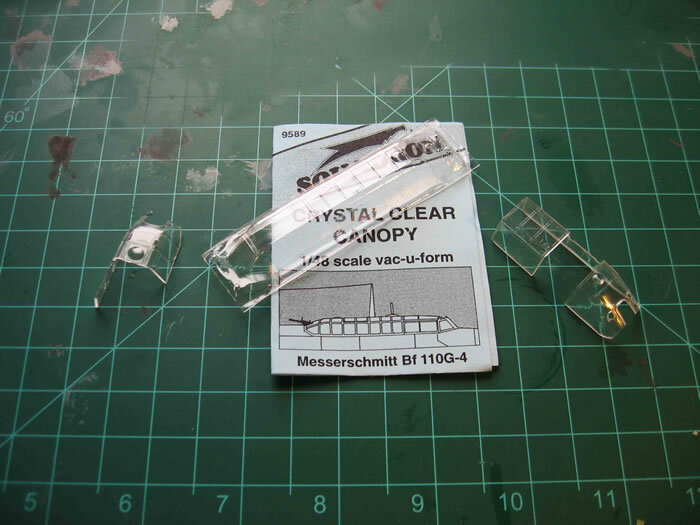 The Eduard clear parts didn’t fit the Revell fuselage and suffice to say I didn’t like either the squadron clear canopy which I ordered or the results of my own attempt at vac-forming … so in the end I opted to display the aft canopy closed, allowing me to use the Revell part. 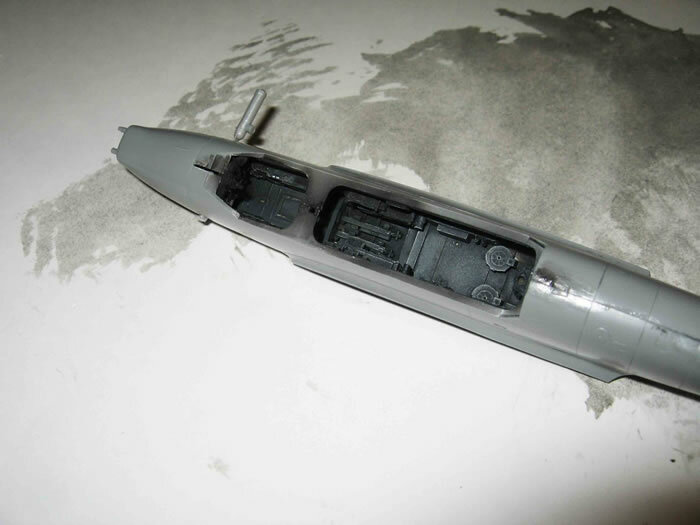 I then used a mixture of Revell and Eduard clear parts for the various front sections. 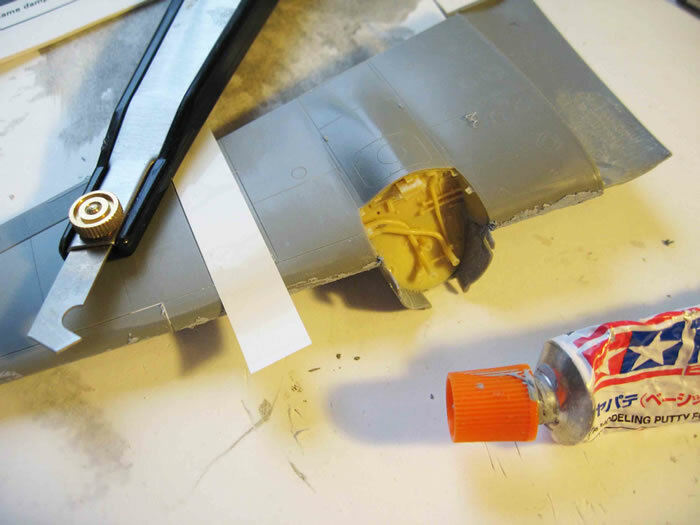 I used Eduard’s pre-cut canopy masks but also masked selected and internal panels by hand using small strips of Tamiya tape. By some small miracle I managed to finish attaching everything without breaking the tiny antennae bristling from the nose! This is a unique-looking aircraft and the final appearance of the model is very pleasing in it’s back-lit glass-cabinet. 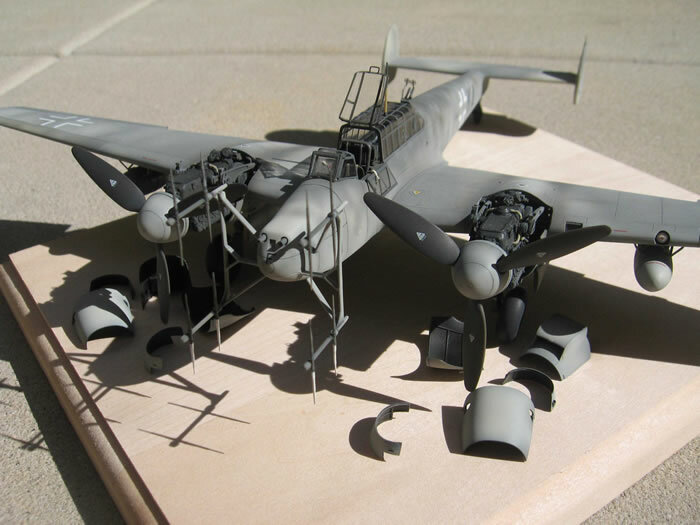 I’m on a mission to deal with the kits I have “stashed” in my office, so have begun to lay out Tamiya’s Anteater on my work-bench but when looking for reference shots of nocturnal 110’s I came across plenty of pictures of Heinkel’s “Uhu” and I have to say I’ll be building the 335 with one eye on the finish-line so that I can justify buying a night-owl and going to town with CMK’s detail sets! So many aircraft, so little time.